An accidental discovery on 31.05.1990 unearthed one baked clay plot containing few gold objects in the premises of Myanmar Temple adjacent to the excavated area of Sarnath. These antiquities were probably related with the high religious value as they retained religious symbols popular in Buddhist religion and art. The pot, contained objects of high antique value, although majority of objects were very fragile and broken. 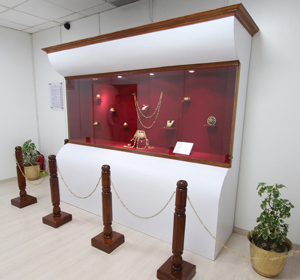 This collection consists objects of gold, gold foil, copper, copper plated with gold, clay wrapped in gold foil and breads of semi precious stones etc. 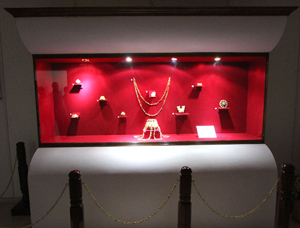 The objects made with gold were of various forms i.e. 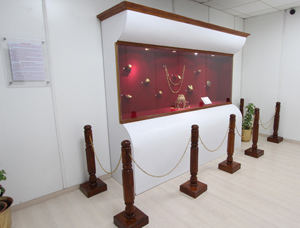 wheel, replica of stupa, triratna symbol, beads and flowers etc. besides these are some figures like flying celestial and standing human being (Buddha?) and human face etc, above mentioned antiquities are dated to 2nd - 1st cent. B.C.E.